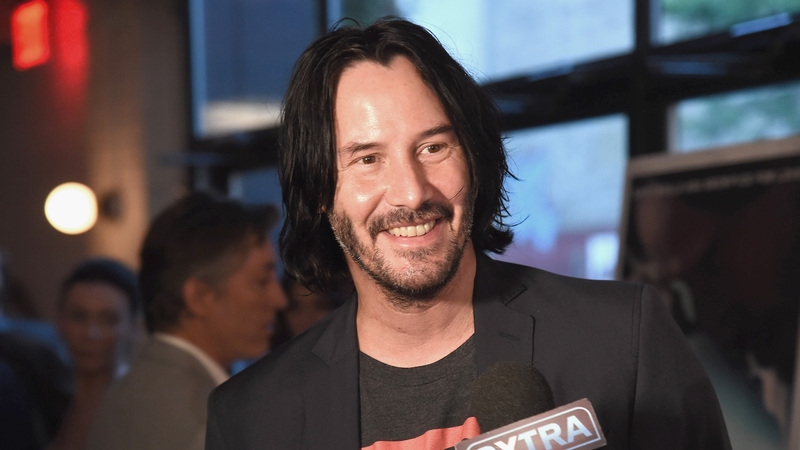 If you're getting married before summer officially ends in September, you may have a surprise guest at your wedding: Keanu Reeves. Yes, that Keanu Reeves. Apparently, the handsome actor keeps getting photographed with couples just as they're about to tie the knot, which may or may not be a publicity stunt for his new movie, Destination Wedding. More: Wait, Are Winona Ryder & Keanu Reeves Really Married? HuffPost reports that Reeves has snapped photos with at least two couples at their weddings in August. Kilt makers Slanj Kilts tweeted a photo of Reeves with a couple in New York, writing, "Best #Wedding Picture EVER! Moray & Maura recently got hitched in New York and were #photobombed by a rather scruffy chap passing by. We think Moray looks way better than #KeanuReeves in his stylish @slanjkilts Modern Inglis #tartan #kilt and Midnight Blue Crail kilt outfit!!" It is a really good kilt, and Reeves is "a rather scruffy chap." He's smiling wide in the photo with the happy couple, waving at the camera, and it's honestly like a whole new side to the notoriously one-note actor. But wait! That's not all. In an interview with HuffPost on Monday, Jordan Camara (pictured below with Reeves) said that his brother and his new wife, Jarrod Camara and Leslie Walker, spotted Reeves at the Dream Inn in Santa Cruz, California, literal moments before they walked down the aisle. They asked the actor for a photo and he kindly obliged, again showing a lot of emotion — and looking just as scruffy as he did in New York. “My brother went over and Keanu got right up and shook everyone’s hands and then did that awesome pose for the picture,” Camara said. “He was just as calm and cool as you would think he’d be and he was happy to take a picture with them. It was really just a couple minutes right before the wedding but it made the bride and groom super happy right before they tied the knot." As HuffPost notes, Reeves is currently promoting Destination Wedding, in which he stars alongside his longtime friend Winona Ryder. According to the plot synopsis, Frank (Reeves) and Lindsay (Ryder) meet on their way to a destination wedding, then realize that they basically hate everything — but they hate it together. Sounds like an excellent romantic comedy, honestly. We don't know if Reeves is snapping photos at weddings he wasn't invited to attend in order to promote his movie or just because he's a super-fun guy, but either way, we're here for it. Like Bill Murray and Maroon 5 before him, Reeves is adding a little extra sparkle to these couples' special days.